David Attenborough narrates the story of Rodrigo Medellin, Mexico's very own 'Bat Man', who has dedicated his life to saving bats. Now the legendary drink tequila is also at stake. David Attenborough narrates the story of Rodrigo Medellin. Since he first kept vampire bats in his bathroom as a child, Rodrigo has dedicated his life to saving them. Now Mexico's most famous export, tequila, is at stake. Rodrigo's beloved lesser long-nosed bat is crucial to the liquor - pollinating the plants the drink is made from. 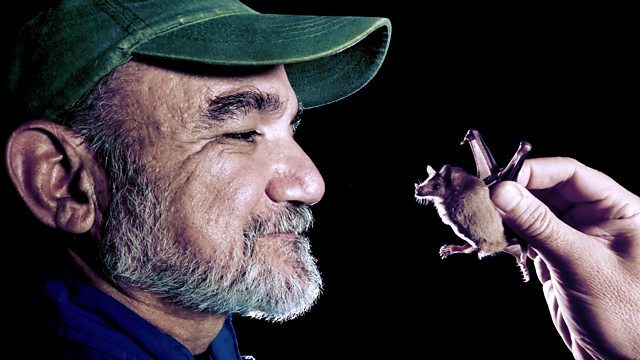 To save both, Rodrigo must track the bats' epic migration across Mexico - braving hurricanes, snakes, Mayan tombs and seas of cockroaches. The threats are very real for not only Rodrigo and the bats, but also for anyone with a taste for tequila. Director Tom Mustill (left), producer Peter Fison (centre), cameraman George Woodcock (right) in the cave of serpents, wearing masks to protect against lung diseases. A drone is used for aerial filming, capturing the bats in flight. Setting a cable dolly at the top of a Mayan temple deep in the rainforest. Director Tom Mustill and the film crew watch as millions of Mexican bats emerge from the volcano. More ‘behind the scenes’ information from Tom Mustill, director of ‘The Bat Man of Mexico’. Please note that the title of this article includes some bad language.